If you live in a house, you probably already know that keeping the various exterior areas clean requires a lot of work. Your deck, terraces, exterior walls, backyard, garden, fences, driveway, pool, etc. all require regular washing to get rid of not just stuck bird droppings and mud, but all sorts of dirt and grime that accumulate over time. A pressure washer is the tool that you can use to simplify the task of keeping the various parts of your property sparkling clean. Pressure washers usually consist of a motor that drives a high-pressure water pump, a high-pressure hose, a trigger-gun type switch, and a spray-wand. Often, the water supply is connected to the unit using a garden hose. Various nozzle tips that can be attached to the spray-wand control and vary the water velocity and profile. Some pressure washers also allow detergent to be introduced into the water stream, improving the cleaning process. Most pressure washers are either electric or gas powered. Electric pressure washers need to be plugged into a normal electric outlet and typically deliver water pressure up to about 2,000 psi. If you need to take your pressure washer to areas where connectivity to an electric outlet is not possible, or if you need to reach water pressure levels above 2000 psi, you should be considering a gas-powered unit. This article will compare two of the best and most popular gas-powered pressure washers. If you'd rather see a comparison of electric pressure washers, please click: Comparing Popular Electric Pressure Washers. Note that pressure washers are dangerous tools and should be operated with due regard to safety instructions. They should be kept away from children as water pressure near the nozzle is powerful enough to cause serious injuries. This article will compare Generac 6923 and Simpson Cleaning MSH3125-S gas powered pressure washers. These were not just the most popular among Amazon customers at the time this article was written, but they had also received excellent reviews from most Amazon buyers (an average rating of 4.5 stars each, out of 5 stars!). The SIMPSON MSH3125-S wheels need to be inflated, GENERAC 6923 wheels don't: they are never-flat wheels. The spray wand (or spray lance) of both products are designed so that the various nozzle tips can easily be connected and disconnected to the wand as required. 0°: For powerful spot cleaning of hard unpainted surfaces, or for hard to reach areas. Should not be used on wood. 15°: For intense cleaning of unpainted surfaces. 25°: For standard cleaning nozzle for most applications. ​40°: For cleaning of painted or delicate surfaces. SIMPSON MSH3125-S does not have an on-board detergent tank, but it comes with a siphon that can be attached to a port on the pump and lowered into the detergent container. 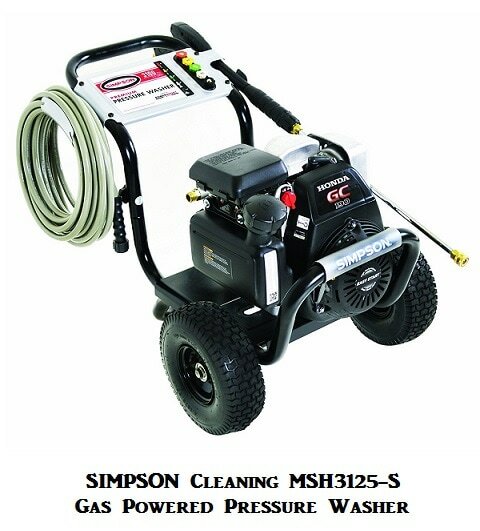 SIMPSON MSH3125-S comes with a 2 -year warranty on the engine, 1-year on frame and pump components, and 90-day warranty on spray accessory items. So which gas powered pressure washer should you get? Both pressure washers considered here are excellent products as shown by the average rating each had received from Amazon customers at the time this article was written. Indeed, both had received 4.5 stars (out of 5 stars), and there is a good chance that you would be quite happy with either product. SIMPSON MSH3125-S has a slightly higher maximum flow rate (2.5 GPM vs. 2.4 GPM for the GENERAC 6923). SIMPSON MSH3125-S comes with the additional 15° nozzle tip. 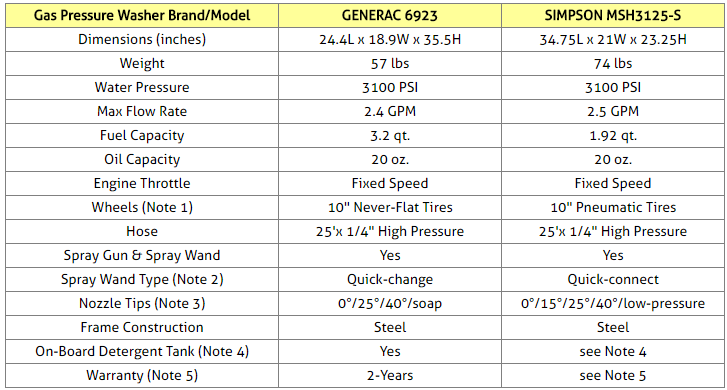 GENERAC 6923 has never-flat tires, while SIMPSON MSH3125-S has tires that need to be inflated. GENERAC 6923 has an on-board detergent tank while SIMPSON MSH3125-S doesn't. But the lack of tank should not be a problem as it comes with a siphon that can be attached to a port on the pump and lowered into the detergent container. Other than that, both pressure washers are perfect for those looking more than adequate cleaning power with minimal investment.